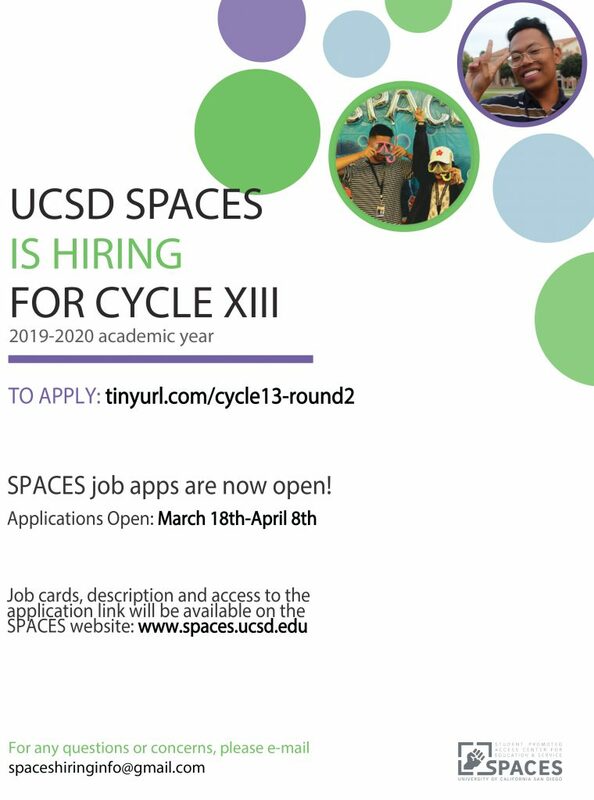 The mission of the Student Promoted Access Center for Education and Service (SPACES) is to act as an empowering dynamic on campus where UCSD students collaborate to achieve greater educational equity. This encompasses equal access to higher education, undergraduate retention and graduation, and matriculation to graduate and professional schools. SPACES values the power of student initiated action and organizing by providing an environment for student growth and development and thus is a foundation to create leadership and unity through community engagement. All SPACES student staff positions are focused on increasing access to higher education, improving retention in higher education and encouraging matriculation to graduate/professional school. All student staff are expected to work in a highly collaborative manner in order to collectively improve campus climate and our connection with the San Diego community. The (8) director positions are appointed positions that serve as administrative and supervisor roles that coordinate and manage the programs and internal structure of SIPHR, SIAPS, SPICEE and SPACES. They also focus on developing leadership with student staff, board members and volunteers. We will be reviewing applications on a rolling basis; thus, priority consideration will be given to applicants who submit their applications early. Optional: Letter of RecommendationJob apps will open Monday, Dec.10th by 11:59pm with preferential consideration given to those who apply by Sunday, Jan. 28th at 11:59pm ( apps will remain open until all positions are filled). We offer (32) student staff coordinator positions that are specific to (4) four focus areas which provide an experience to develop specific knowledge and skills that are adaptable to any work environment. Though many of the student staff positions entail working with certain communities, experiences will be taken into consideration, but also commitment and the ability for growth since SPACES student staff positions allow individuals the opportunity for self-reflection, growth, and raising consciousness within themselves. The (8) director positions are appointed positions that serve as administrative roles that help interns coordinate and manage the programs and internal structure of SIPHR, SIAPS, SPICEE and SPACES. They also focus on developing leadership with interns, board members and volunteers.